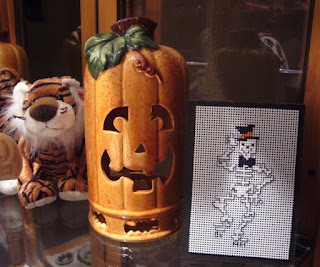 I think for October I will post some of my Halloween stitching. This was a kit I picked up at a shop in Arizona a number of years ago. The skeleton is worked on white perforated paper and it is glued to a black easel backed cardboard. Sorry, but I gave the chart away and do not know the designer (it would be bad taste to have made a copy of the design you know). He stays in my china cabinet all year long with his other buddies seen here. What a wonderfully scary little fella! Love the little skeleton. He's adorable!